Written by: JediJondee46 on March 19, 2017. Bernie Wrightson, legendary for his horror artwork, has died of brain cancer at age 68. Thank you for the many years of love and support! He was born on October 27, 1948 in Dundalk, Maryland and studied art at the Famous Artists School. Bernie Wrightson met artist Frank Frazetta who inspired him to illustrate his own stories. His first published comics work was House of Mystery #179 (1968); “The Man Who Murdered Himself” written by Marv Wolfman. Wrightson worked on Marvel horror titles; Chamber of Darkness #7 (1970) and covers for Tower of Shadows. Len Wein and Bernie Wrightson worked together to create The Swamp Thing in House of Secrets #92 (1971). The character has been through incredible talents like Alan Moore and Len Wein returned to write a six issue Swamp Thing series in 2016. He was adapted to film in Wes Craven’s Swamp Thing (1982), a sequel, The Return of the Swamp Thing (1989), and even a television series which ran from 1990 to 1993. In 1975, The Studio was formed by Jeff Jones, Michael Kaluta, Barry Windsor-Smith and Bernie Wrightson to work apart from the comic book companies. Bernie Wrightson had begun working on the Warren Publishing magazines. I recall Creepy #113 (1979) in which he adapted H.P. Lovecraft’s “Cool Air.” Wrightson created Captain Sternn in a June 1980 issue of Heavy Metal magazine that was used in a segment of the Heavy Metal (1981) animated film. He adapted Frankenstein in 1983 by Marvel Comics with 50 illustrations. In 1983, Wrightson illustrated the graphic novel of the Creepshow (1982) film. He continued to work with Stephen King illustrating his novella, Cycle of the Werewolf (1983), a restored version of The Stand, and also The Dark Tower V: Wolves of Calla (2003). Wrightson and Jim Starlin produced a comic book one-shot, Heroes for Hope, in 1985, for African famine relief. He worked with Jim Starlin on Batman: The Cult (1988) and again on Punisher P.O.V. (1991). 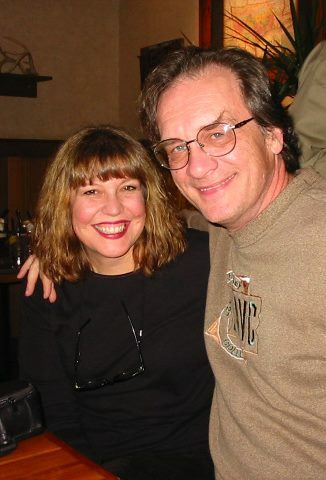 Wrightson worked on several films including Ghostbusters (1984) as a creature design consultant, concept artist for Galaxy Quest (1999), and character designer for Spider-Man (2002). As it comes to all of us, the end came for the greatest that ever lived: Bernie Wrightson. My North dark star of youth. A master. More reactions from the comic industry can be found here. I saw several Bernie Wrightson Frankenstein illustrations at the Guillermo del Toro: At Home with Monsters exhibit. 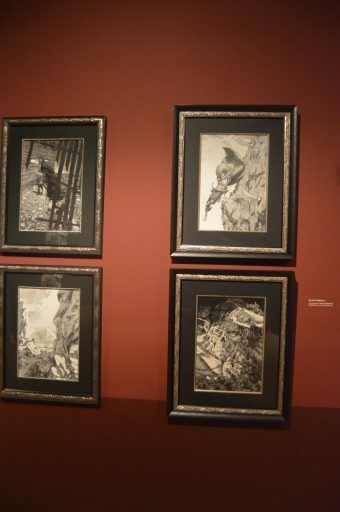 Photo of Bernie Wrightson’s artwork at the Guillermo del Toro: At Home with Monsters exhibit at LACMA (by the author). Bernie Wrightson was an incredible comic book artist, he was part of the group of fine artists who formed The Studio, and one of his greatest works was adapting Mary Shelley’s Frankenstein. At one convention, I spent almost an hour looking at a print with all of the details of the monster holding Dr. Frankenstein in a lab full of vials, shadows, and the tiniest details. The stark black and white made it powerful. It captured a moment from the book and the 1931 James Whale film. His Frankenstein’s monster had a skull-like face and powerful body that seemed more real than any other vision. Bernie has incredibly polite allowing me to pour over it. In 2012, Wrightson collaborated with Steve Niles for Frankenstein Alive, Alive! for IDW Publishing. It reached three issues. Bernie Wrightson’s art will always be treasured by his fans and stand as great artwork worthy of any museum.